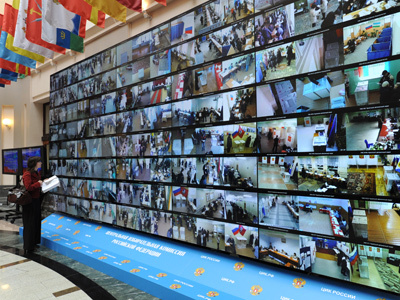 International monitors have said that the video monitoring system tested at Russian presidential polling stations exceeds everything they saw in their home countries – or anywhere else in the world. At a Moscow press conference soon after the last polling station closed in Western Russia, monitors agreed that the elections were held in a normal mode and without serious violations, but the web camera system that allowed anyone to personally check the situation at polling stations got the foreign specialists especially excited. “Judging by the results of our visits to the polling stations, we can make a statement that the Russian video monitoring system exceeds all international standards. It is wonderful that this complicated election mechanism is working,” the Interfax news agency quoted Alessandro Mussolini, an independent observer from Italy, as saying. “Everything was, well, transparent and open. Russia has opened a new page in history today – there is a broadcast of the Russian elections all over the world,” Bulgarian monitor Milan Bozhevich noted. Another observer, Tomislav Nikolich from Serbia, told reporters that his country's last presidential poll lacked the same, full level of democracy that he could now see in Russia. The web-based monitoring system was tested for the first time on Sunday. 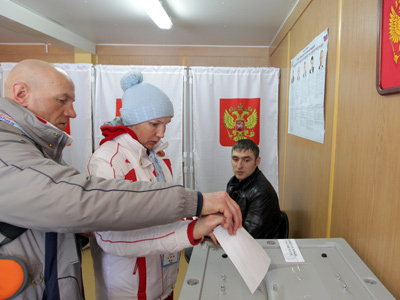 Prime Minister and presidential candidate Vladimir Putin suggested the unprecedented measure after allegations of widespread ballot-rigging were made following December's parliamentary poll. Election officials said that over two million people registered online to watch the live transmissions from the stations. Additionally, a special screen was set up in the information center for covering the elections – so that journalists and foreign observers could also watch the broadcast.